As you guys know, I spent nearly every Wednesday night this summer with friends in Dupont Circle enjoying Lululemon’s free outdoor yoga class series. Now that that has ended and the cooler weather has moved in, we decided to keep the tradition of healthy friend dates (yoga + a cheap/healthy dinner) going, instead exploring some of the many awesome yoga studios in the Dupont area of DC. Last week, my friend Karen and I decided to hit up Yoga District for their 5:30 p.m. “Yogalates” (yoga + pilates) class. 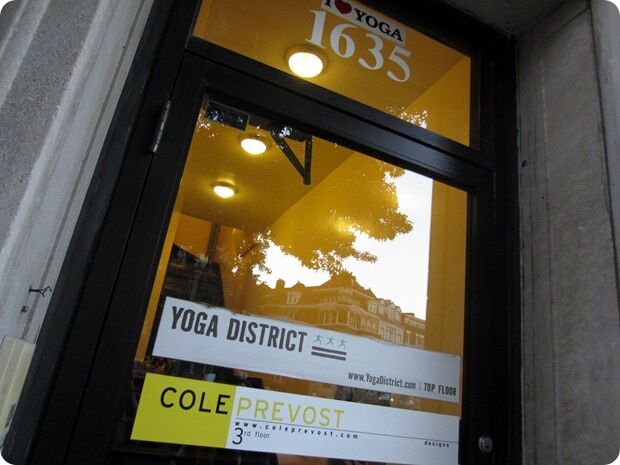 I’d never been to Yoga District before, and found the studio to be friendly and unpretentious. You also can’t beat the price – their classes are almost all $11, or simply donation based. Yoga in DC for $11?! That’s a steal. And it’s not just the classes at weird/unpopular times that are that cheap, either – all of them are, even at peak hours. Pretty sweet. The Yogalates class was fun – back in the day when I belonged to Gold’s Gym, I used to go to a “PiYo” class there all the time that was similar. Basically, they start with pilates to work out your abs, hips, etc, and then end with nice stretchy yoga. It was a pretty easy class cardio-wise – we weren’t really sweating – but it had a nice, simple flow and we left feeling refreshed and toned. I loved all the hip work, too – great for running cross-training! After the class, Karen and I hit up Sweetgreen and enjoyed our salads al fresco while people watching in Dupont Circle. 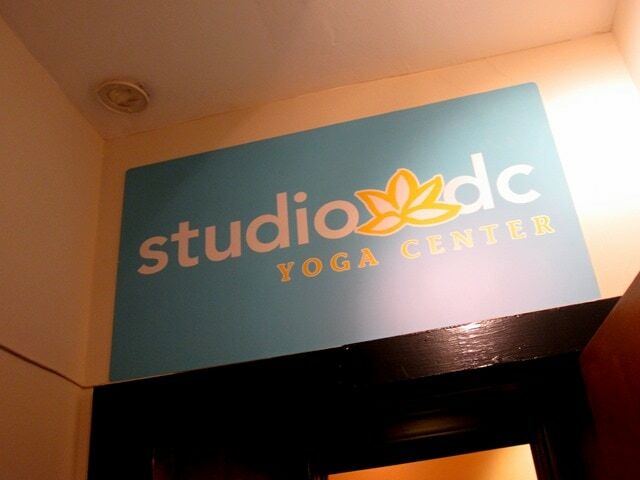 For last night’s yoga adventure, my friends Karen, Sarah, Chrissy, and I decided to hit up The Studio DC for their 6:15 p.m. hot vinyasa flow. I’ve been to Studio DC before and really liked it, but hadn’t been back in quite awhile. I was excited to return! Normally the hot vinyasa class on Wednesday nights is taught by Shauna, who I know because she used to sometimes do a short yoga for runner’s session after our Lululemon run club last summer, but last night her yoga for runners partner Johanna was subbing for her. It was great to see her! Last night really reminded me why I love yoga so much. Yoga has taught me to calm down and be present. It has taught me the power of positivity. It has taught me that I don’t always have to work to be better or faster or stronger – I just have to focus on my breath. It has taught me to remember to be kind, both to myself and to others. And above all, it has taught me to always make time to take care of myself. I’ve said this before, but try to think about exercise as a gift – something you are doing for yourself that no one can take from you – an opportunity, not an obligation. Johanna turned down the lights in the studio for the last 5 minutes of class, and I remember feeling so relaxed and grateful that I had given myself that hour and 15 minutes to just slow down and breathe. No phones, no computer, just me and the mat. The classes at Studio DC aren’t cheap – a drop in was $17 – but it’s safe to say we’ll be back. Thanks for the awesome class, Johanna! Feeling rejuvenated (and very sweaty), the girls and I headed to nearby Teaism for a post-workout dinner. lentils, Moroccan carrot salad & raita, a yogurt sauce. It was SO good – I practically licked my plate clean. What have you done lately to treat yourself kindly? 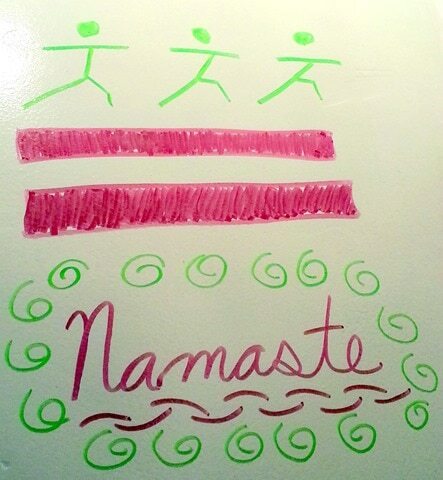 I love the Bikram classes at Bikram DC (in the same building as Yoga District). If you like hot yoga, you should definitely try that out. All of their instructors are amazing and it really is 90 minutes of de-stressing zen and sweat. I like hot vinyasa a lot, but bikram isn’t my thing. I tried it a few times but I just prefer less hot rooms and more varied poses! I know a ton of people love it though so thanks for sharing the studio rec! 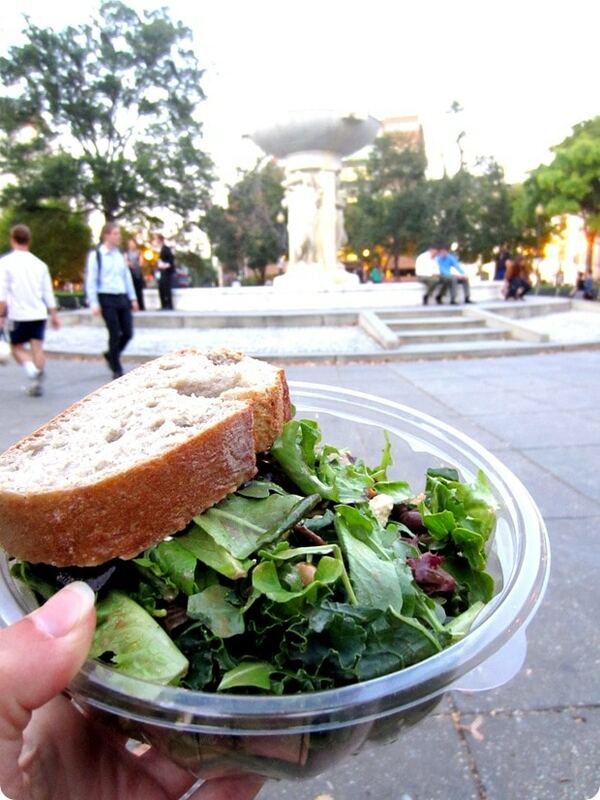 I love yoga + healthy dinner as a friend date idea! I’ve never tried a yogalates class before but it sounds really fun. Individual classes are so expensive in SF – $20 at the very least! I’ve been doing yoga hikes in DC as a way to meet up with friends, be outside, and to work out- the ultimate in multitasking! The instructor Danielle- is great and Rock Creek Park is big enough that you are outdoors but not near cars, tons of other people etc. http://www.yogahikesdc.com Classes are 1.5 hours and I never look at my watch, whereas I often find myself doing just that when I’m working out indoors. That sounds awesome! Thanks for sharing! Yes. I do that all the time! We do walk and talk dates to catch up and multi task! 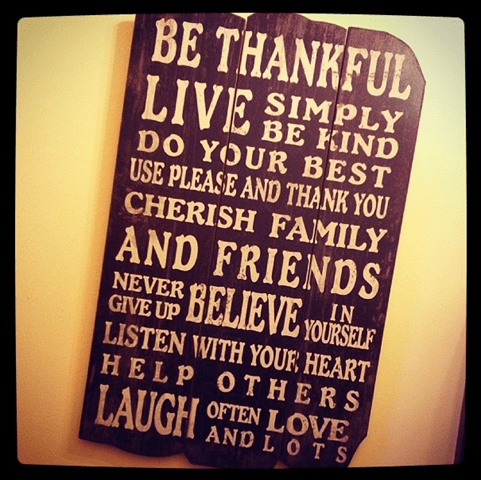 Loved this post! I am fairly new to yoga and a gym I go to recently started offering classes for $5 (all the classes are the same price) this is great! Except, I found myself getting annoyed that there would be so many new to yoga people at the classes, and they weren’t taking it seriously. When we get to complicated poses everyone is laughing and giving up. I’m no expert by any means, I think I’m just super focused. Last night before class I sat and observed everyone and all the new people and I thought, just listen to my body, my breath and the instruction. And, that worked, even when people were laughing, sometimes I just smiled right along with them – I left feeling so happy! Anne! You’re making me want to try yoga (I’m still CrossFit only these days). I LOVE that Teaism–such a good deal, the tea is awesome, and the food is surprisingly great. I went to ShopHouse in Dupont the other night for a “healthy-ish” friend date–I recommend it for future cheap/healthy dinner night! It’s like Sweetgreen/Chipotle but for southeast Asian food, and depending on what you order, it can be healthy and delish. Hope all is well! You should try it! 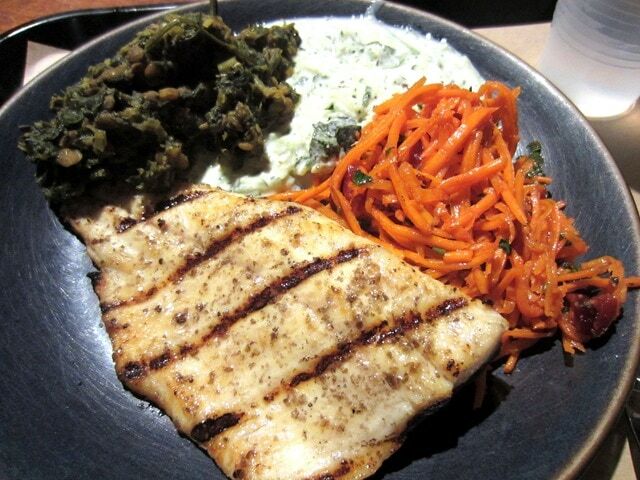 :) I’ll have to check out ShopHouse – sounds yummy! Hope you’re well, too! Fun! Same color?? I love it! Reminds me of the lululemon tanks. Wish we had more Yoga studios here! They have classes in some gyms but you typically have to sign up for a series of 9 – 10 sessions…I need to give it a another try for sure! I love yoga for many of the same reasons. I don’t know if you’ve found this, but the dietitians that I know (myself included) tend to be pretty type A personality and have trouble letting go of the to-do list and being present. Yoga helps me to stop thinking and planning for that little bit of time and reminds me to live in the moment a little more! Sounds like fun! I wish my friends where more into fitness! I have one whom I went to college with where we have days like that, its a lot of fun! Good luck on your run tomorrow! LOVE Johanna’s class! It’s one of my faves. I love that reebok top it looks so cute on you! I’ve done hot yoga a few times with friends as a nice way to catch up. $11 is super cheap for yoga, here for a casual class it is usually $20. It was a great class! I had Sweetgreen after but that Teaism dinner looks delish. Had no idea they had food like that. I would love to have healthy dates with friends! I definitely will suggest it. I went to a few yoga classes while in college, but would like to try it again. There are a few yoga studios in the area, but I will have to compare prices. If you are looking for a good deal on yoga and willing to travel to Capitol Hill instead of Dupont, Capitol Hill Yoga has a new (started this fall) offering of Yogahour. It is “warm” yoga (in the 80s) and it costs $8/class. Then just across the street on Pennsylvania is District Taco. Great tip! Unfortunately Capitol Hill is a bit far for me for workouts, but I’ll keep it in mind next time I’m over there!